Since 1994 SLC has brought the world of business closer to you, through an efficient, multi-service. SLC operations include rigorous security and screening procedures, in compliance with federal regulations and industry standards. We will continue to diligently inspect all courier and cargo shipments, with utmost regard for public safety. 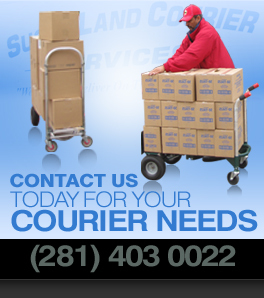 Sugar Land Couriers is a family owned, family run enterprise. That means that the values and work ethic of owner Johnnie Anderson are instilled in all employees. Each courier wears the company uniform for clear identification and security; courtesy and efficiency by each employee are mandatory; drivers are not only radio dispatched to each destination, but also carry cell phones to ensure communication access. We make pickups and deliveries holidays and weekends, and provide warehousing for your shipments if necessary. Trust the proven experience of a leader in the courier service!